Last month, I had an operation and spent a few nights in a hospital. During those nights, I felt soooooo unexpectedly lonely…soooooooooooo vulnerable and sooooooooooo dependent. The doctor/surgeon was skilled, warm-hearted, encouraging and competent. The nursing staff seemed very competent and responsible, but seemed so busy and preoccupied with their data gathering and data entry on their computers and…well, I don’t know what they were connecting to, but it didn’t seem to be offering “warmth” to me. They took excellent care of monitoring vital signs, the various medications and the pain pump that I had for physical pain… and I’m very thankful for that… but I had a different kind of pain…sadness, loneliness and vulnerability. I soooooo wished for a quick, warm smile or a few encouraging or comforting words…but, for unknown reasons, that didn’t seem to happen. That beautiful imagined chair offered such a welcoming sense of love and compassion flowing freely into me, through me and out of me…a lovely, lovely, comforting sensation…. 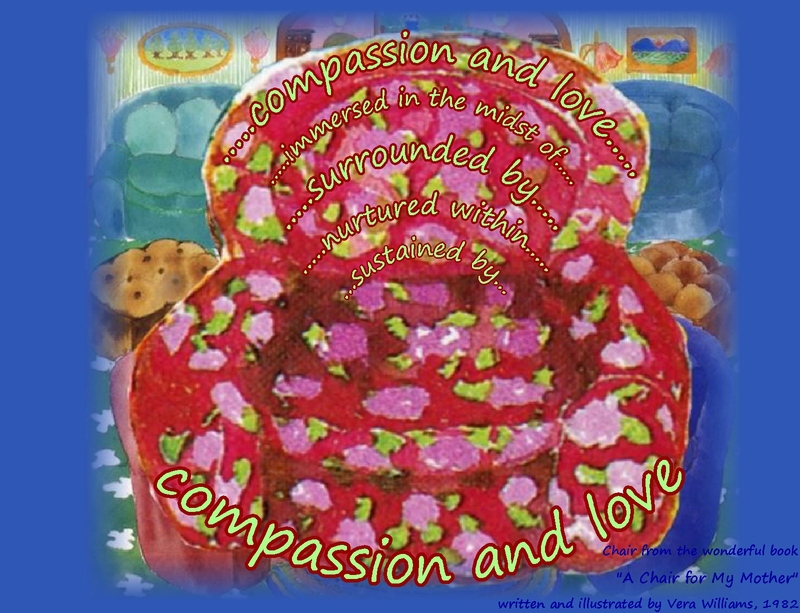 When I got home, and throughout the 2 months after I got home, I continued to imagine sitting in that chair and receiving a rich, continuing flow of Love and Compassion. 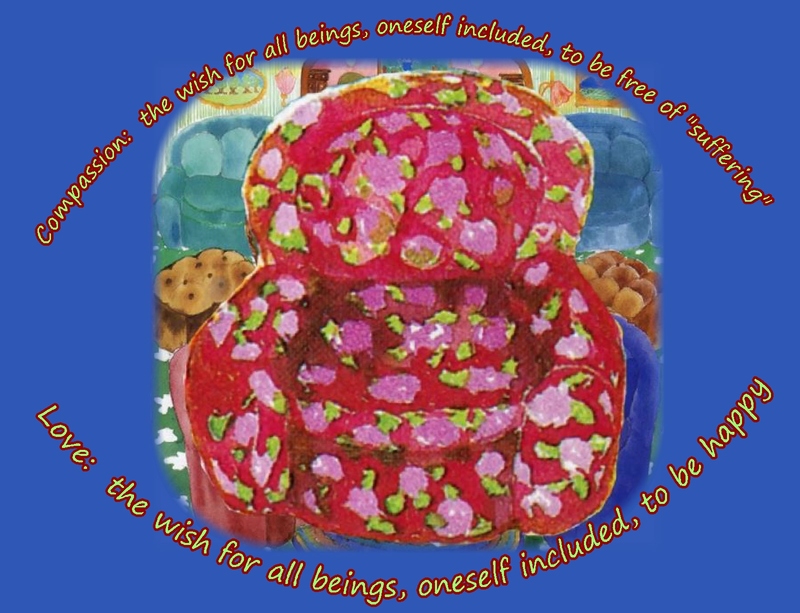 Compassion: the wish for all beings, myself included to be free from “suffering” and to be free from the causes of suffering. 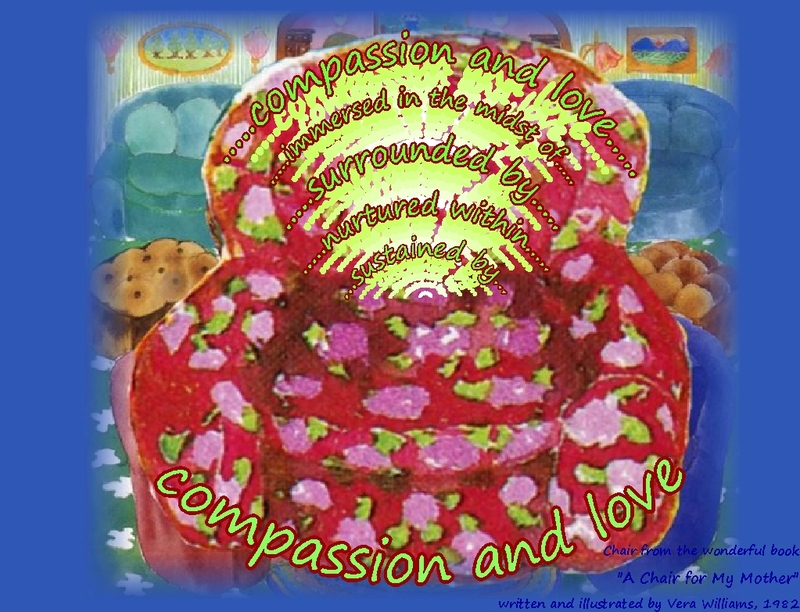 Compassion and love…imagining that sense….immersing into me…surrounding me… nurturing within me… sustaining me…..offering strength and comfort…. ….passing freely through my heart…. ….flowing out to be shared with others…. 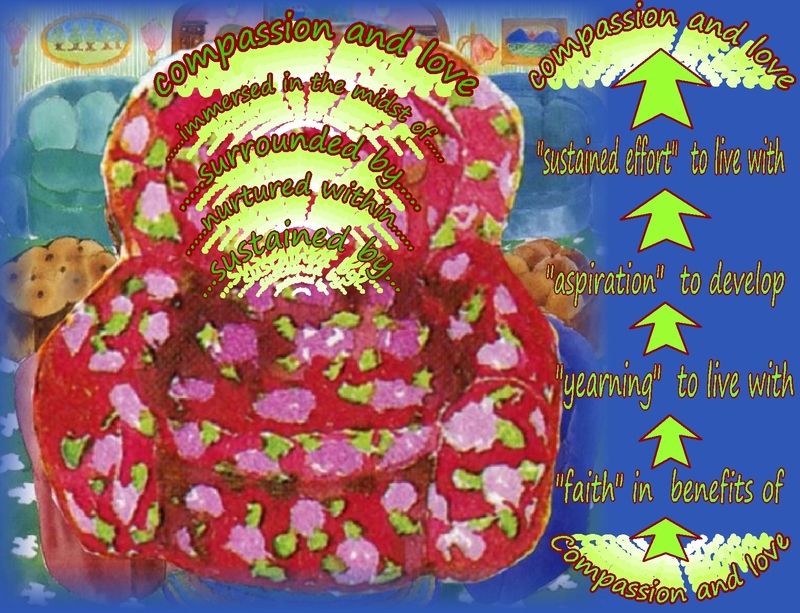 ……….a continual flow of compassion and love……. perhaps, one of the purest forms of beauty and grace…??? …continuing thoughts….after a few more weeks of pondering and reflecting….looking more carefully…putting these ideas into a much larger context…into a context of being part of “common humanity”…. the struggles and challenges of all beings…. 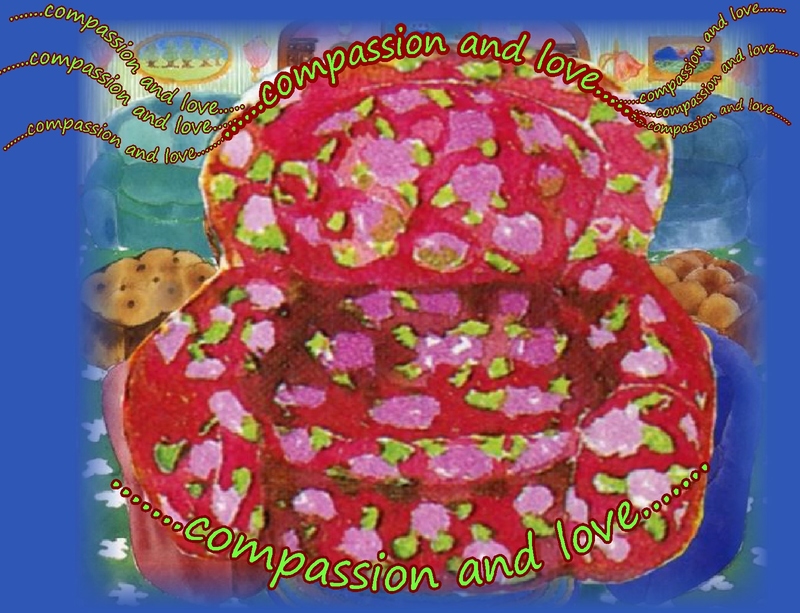 Leading to a deeper, steadier, richer and more abundant sense of “compassion and love“ for all beings, myself included. Opening my heart to the awareness of the incredibly basic levels of suffering so many millions and millions of people experience…hunger, health problems, no access to health care or doctors…. And so…opening my heart and eyes…. so many people in the world who have so many basic, everyday needs and struggles…recognizing their pain and suffering and so sincerely wishing them to be free from suffering… sharing some of what I have with them so that perhaps they too might be free of some of their own everyday suffering…that they will also be able to experience more happiness, more healthy and happy smiles, more vision, more hope…. 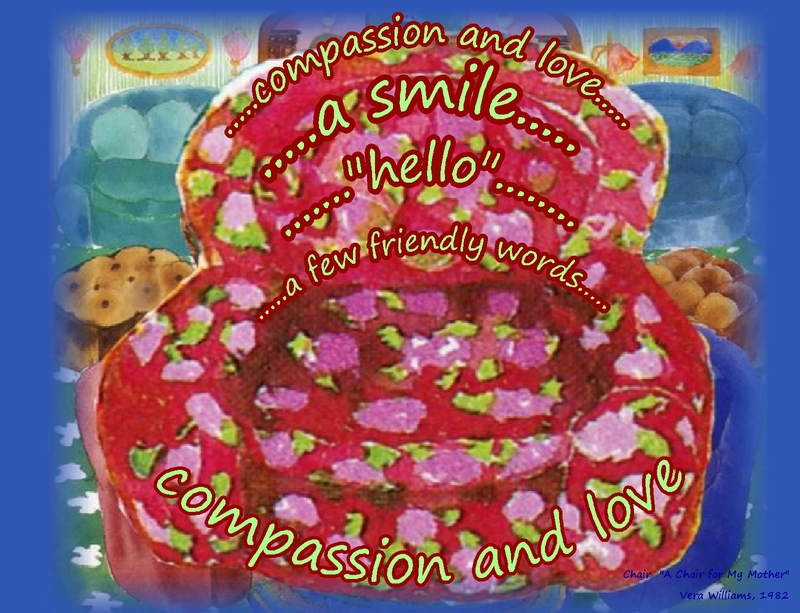 Perhaps…as simple as a warm smile, a happy hello, a few words of interest or kindness. I remember that “fleeting glimpse” of a sense of “suffering” I had felt during those few nights in the hospital…and it HAD felt horrible…And so, to share what I can with those who are experiencing continuing, daily “hard times”…may I help out in whatever manner I can…and may their hard times decrease and come again no more…. 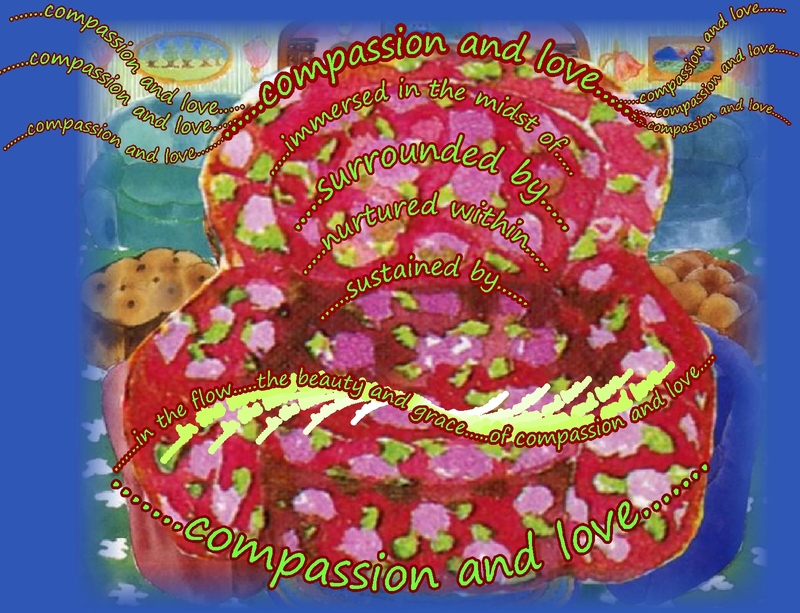 Compassion: the wish for all beings, myself included to be free from “suffering” and to have the causes to be free from suffering. 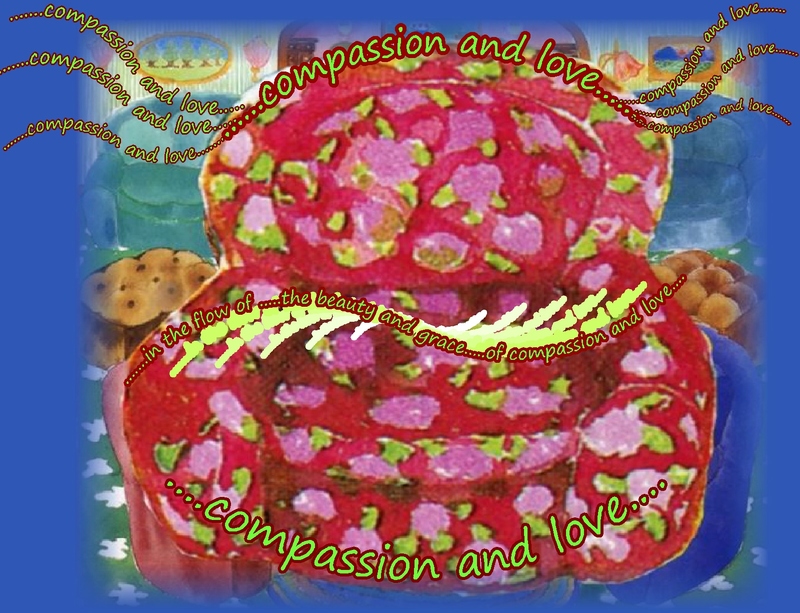 love and compassion….perhaps, one of the truest forms of beauty and grace…??? How strange this seems…feeling such sadness, loneliness and vulnerability in the hospital….remembering that chair from a children’s book…imagining sitting in that chair and taking in a nurturing sense of love and compassion….and then leading to so many awarenesses and understandings about myself and others…spreading outward from my own sense of unhappiness to doing what I can to help others…… how lovely…. I guess…you just never know!